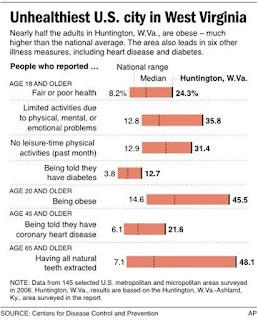 Graphic shows survey results of adult health issues reported in the U.S. and in the Huntington, W.Va.
Nearly half the adults in Huntington's five-county metropolitan area are obese - an astounding percentage, far bigger than the national average in a country with a well-known weight problem. This city on the Ohio River is surrounded by Appalachia's thinly populated hills. It has long been a blue-collar, white-skinned community - overwhelmingly people of English, Irish and German ancestry. The traditional diet was heavy with fried foods, salt, gravy, sauces, and fattier meats - dense with calories burnt off through manual labor. Obesity was not a worry then. Workplace injuries were. But as the coal industry modernized and the economy changed, manufacturing jobs left. The city's population is now fewer than 50,000, and chronic diseases - many of them connected to obesity - seem much more common. The river runs along the edge of town, but it's not a focal point. Marshall and one of the city's remaining factories sit to the east with several blocks of hotels and office buildings farther west. A new complex called Pullman Square - which includes a movie theater and a Starbucks - is trying to become a retail and dining center and illustrates a transition to a service economy. The area's unemployment rate was about 5 percent in September, actually a bit better than the 6.1 percent national average that month. But often the jobs are not high-paying. Many workers lack health insurance, and corporate wellness programs - common at large national companies - are rare. Lack of exercise is another concern. During a warm and sunny autumn week in Huntington - the kind of weather that would bring out small armies of joggers in some cities - it was unusual to see a runner or bicyclist. The exercise that does occur is mostly confined to a local YMCA, at campus recreation facilities at Marshall, or at Ritter Park in a tony neighborhood south of downtown. Smoking - a common sin in West Virginia - has been hard to control, Tweel said. When the health department tried to restrict smoking in local bars and restaurants, a group of local businesses fought it all the way to the state Supreme Court. (The restrictions were upheld in 2003.) Even hospitals have fought smoking restrictions in the past, Tweel said. The latest numbers came from the CDC report, released in August, but little-publicized. It was based on survey data from 2006, comparing about 150 metropolitan areas. The Huntington area includes five counties - two in West Virginia, two in Kentucky and one in Ohio. Of the 40 Huntington-area residents interviewed for this story, many had heard something about West Virginia being one of the unhealthiest states. But only one - Tweel - knew about the latest report showing how bad Huntington compared with other metro areas. Walden is a third generation physician in the area, but he's also traveled extensively around the world. He says it's always a little jolting coming home and realizing how obese his hometown is compared to the rest of the world.